Do you keep a sketch book? I have been keeping one for years. When I finish one I put it on a shelf with the other finished ones and start a new one. I take it with me almost all the time. Even if we are going around town I have it with me. You never know when an idea will pop in your head and you need to document it. When I first started using a sketch book I would us it to practice drawing. Like these pictures of faces. Probably a lot of you are going to tell me that you can’t draw so you have no need for a sketch book. When I was a kid I would draw and play with art supplies, never really thinking I couldn’t paint or draw. Somewhere along that creative journey I started thinking I could not draw, or that I could not draw good enough. But I wanted to draw, I wanted to turn those ideas in my head into art. Drawing is a learned skill just like learning math, or how to write or ski. If you want to draw you can learn too, it just takes some time and practice. And yes, it will come easier to some people than others but keep trying, (we each are given different gifts). I am sure there are many good drawing books but the one I like is “Drawing on the Right Side of the Brain” by Betty Edwards. Here is a link to it on Amazon. I actually like the original version over the revised. It you read it, do the exercises and practice – you will be amazed how quickly your skills will improve. I have taught this to kids and I love when they have that lightbulb moment and everything clicks. Once I started trying to design I would do a little thumb sketch to document my idea. Some sketches are very vague, but I know what they mean. and anything else I think of. At one time I would not have wanted to waste all these beautiful pages to draw on for notes, but it is wonderful to be able to find everything in one place. Plus I enjoy looking at my sketches as I look for a certain note. Once the Mixed Media books came out I started using them for my Sketch book. With the paper being a little heavier I would use my sketch book to workout design ideas and colors by painting in them. Here I worked on some of the colors and flowers for this watering can. If you remember from another post – (The Beginning of Designing) I had done this piece three times before I was pleased with it. You can see how I worked on the background and stencils on these pieces. Some projects have been worked out entirely in my sketchbook like these shells. while other projects I just did testing of colors like here on these angels. 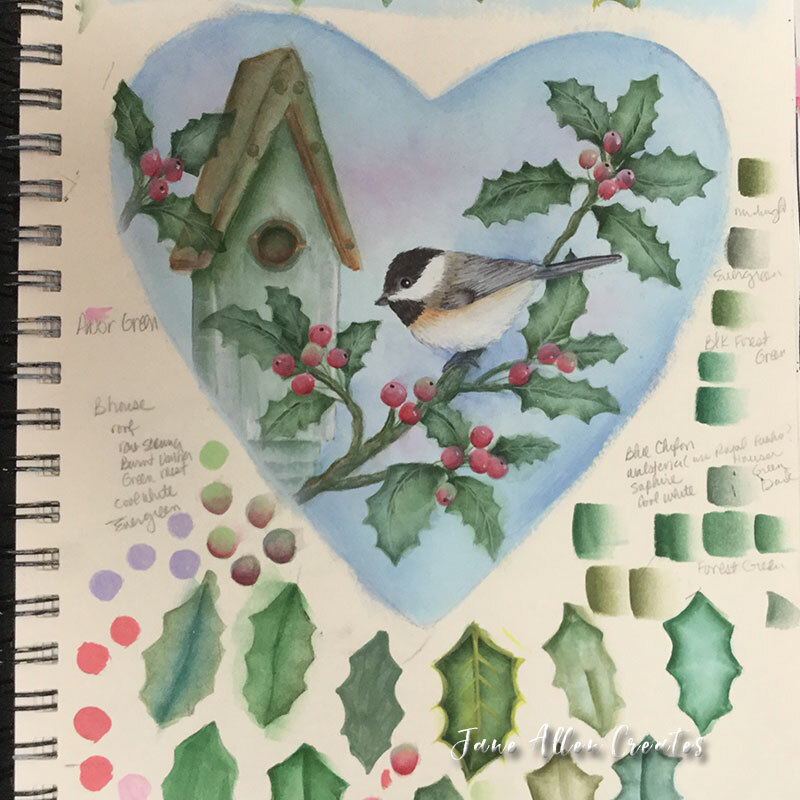 This page was one of the first projects I had published and I tried all different color combinations to make sure I was happy with my holly leaves. As you document things you will find you have to do it less and less because you will know the combinations you like and you will gain confidence in your design decisions. When I look back through my sketch books I am amazed at how many things have turned into designs. I also find when my well is dry and I don’t know what to work on, going through my sketch books gets my creative juices going. I hope you are encouraged to keep a sketch book. Even if you don’t draw/design I would encourage you to keep a sketch book of all things art. And hopefully you will start drawing. Who knows where it might lead. I would love to hear how you use you sketchbook. Thank you Thelma, it does help to keep me organized. Thank you Effie, it helps me to be a little more organized. Thank you Wendy, it helps me to look at different color combinations than to recreate them. You are welcome Myrtle, it is nice having all your sketches and art related things in one place.